Hidden Gem on the Anclote River. 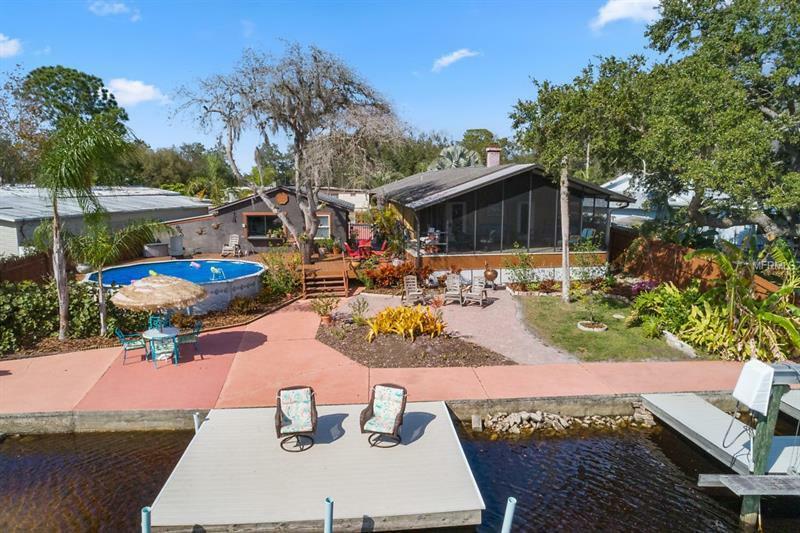 Rare opportunity to live so close to Pinellas and Hillsborough counties and live on the water. Zero neighbors across the river giving you total privacy and a million dollar view! Enjoy watching dolphins, manatees, sea otters, jumping fish and bald eagles while enjoying the secluded pool area provides sunning area without the beach. Equipped with a boat hoist, hop in your boat and be at Tarpon Springs Sponge Docks in less than 30 minutes or a 5 minute car drive. This 2 bedroom 2 bath has a huge screened in porch with breathtaking views of the river. Living room has a fabulous wood burning fireplace; the solid oak kitchen is spacious and fun to cook in with the solid Corian surface/oak island. The converted garage has a kitchen with refrigerator, sink and small but ample living space with a great water view from kitchen. Or rent the space out as an AirBNB and collect thousands of dollars while living in the converted garage. Or rent the garage out or have one space for Mom and Dad. (Flat ground to garage 36" clearance.) Bring your fishing poles, boats, kayaks and paddle-boards. Plenty of parking in the fenced yard. Golf Course, 9 holes for $10-$15. Then go have a wood grilled burger at the restaurant or fish fries on Friday's!